If you have walked by the OsteoStrong centre in Puerto Banús and observed people performing exercises on machines, you may have mistaken it for a gym. OsteoStrong actually has a very different mission to a gym; it is the world leader in bone fracture prevention, relying on a unique series of short exercises to increase muscle and bone density in order to keep osteoporosis and bone fractures at bay or even reverse osteoporosis altogether. Did you know that 2.8 Million people in Spain are diagnosed with osteoporosis, or that 330,000 people suffered fractures last year? Hip fractures are not only painful; they dramatically increase the risk of death in those aged 65 and over. Osteoporosis cost the Spanish public health system a whopping €4.2 billion in 2017 alone. All these statistics beg the question: why aren’t citizens being told that there is a way to keep our bones strong in our senior years using a technique known as ‘Osteogenic Loading’? 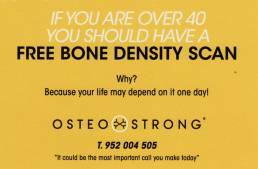 What is the OsteoStrong System? Charles Berger, owner of OsteoStrong Marbella in Puerto Banús, notes: “The OsteoStrong system (that of Osteogenic Loading) works very differently from a typical workout at the gym. Rather than focusing on just lifting weight, it provides our bones with levels of pressure that would be impossible to achieve through normal weightlifting or other traditional ways of exercising and thereby stimulating bone growth.” The workout is short and sweat-free (it takes around 15 minutes) and best of all is that clients only need to visit the centre once a week to reap the benefits. Osteoporosis is a silent disease; it often shows no symptoms at all, until a fracture occurs. It is therefore prudent for all ageing adults to have a quick and easy bone DEXA scan. This is a free, simple, and painless test provided by OsteoStrong that measures your bone density at the heel of the foot in just minutes. By using OsteoStrong you can prevent or even reverse this condition if you have already been diagnosed with it. OsteoStrong’s bone fracture prevention strategy takes only 15 minutes once a week. You have nothing to lose and everything to gain by picking up the phone and booking your free scan and first free session today.